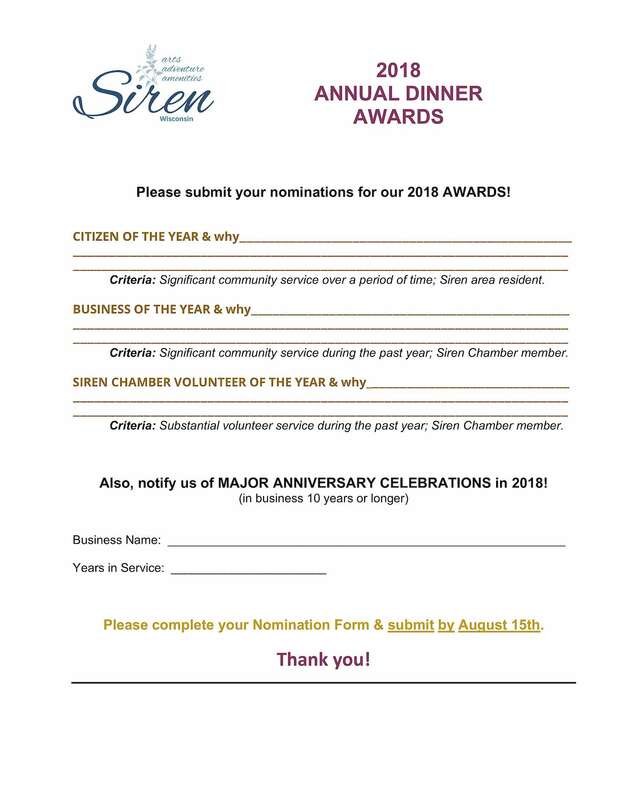 The Siren Chamber of Commerce is seeking your nominations for their annual awards. 2018 Citizen, Business, and Chamber Volunteer of the Year winners will be recognized at their Annual Awards Dinner being held on September 18th, 5:00 to 7:30 pm at Northwoods Crossing Event Center in Siren. The criteria for this award nomination is 'significant community service over a period of time.' The person must be a Siren area resident. The criteria for this award nomination is 'significant community service during the past year.' The business must be a Siren Chamber member. The criteria for this award nomination is 'substantial volunteer service during the past year.' The person must be a Siren Chamber member. In addition to the name(s), please indicate the award category and include the reasons you are nominating this individual/business for each, highlighting their specific contributions. All submissions must be received no later than August 15th. Your information may either be phoned to 715-349-8399, emailed to chamber@VisitSiren.com, or mailed to Siren Chamber of Commerce, PO Box 57, Siren, Wisconsin, 54872.